Nowadays, car buyers seem to have more transmission and engine options than ever before. 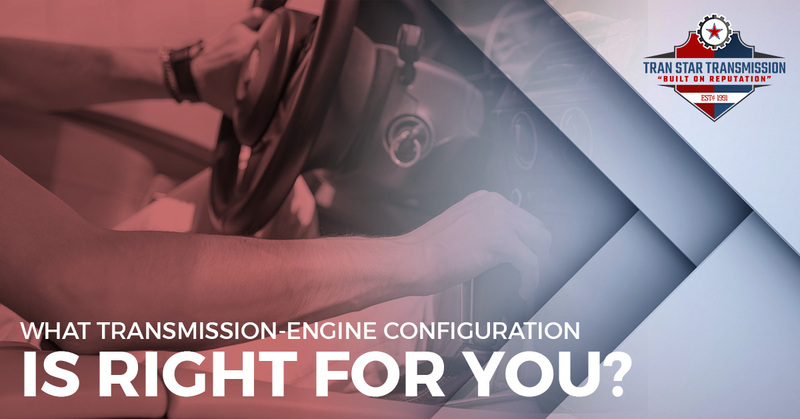 If you are about to start searching for a new vehicle and are wondering what engine-transmission configuration is best suited for your needs, our experts at Tran Star Transmission in Houston would like to help you in making this decision. Choosing the right option for you can not only make your driving experience more enjoyable but also more economical. If you are looking for a Houston transmission shop to handle all of your transmission repairs and maintenance, contact Tran Star Transmission. Our Houston transmission shop has over 25 years of experience providing transmission services, including transmission repairs, rebuilds, maintenance, and more. Schedule your free diagnostic check today! With this type of transmission, automatic gearboxes use gears to match the engine speed to the road speed. As the driver presses the gas pedal, the transmission automatically changes between gears. The combination of gear ratios is chosen to give the vehicle the ideal range of torque and speed. Most vehicles have a total of six gears but can sometimes have as many as nine. To the average driver, an automatic vehicle with a continuously variable transmission may appear no different than one with a normal automatic transmission. However, although the operation of each is the same, the inner workings are much different. Whereas a traditional automatic transmission has gears, the continuously variable transmission relies on a belt and pulley system. The engine turns one pulley, and the other pulley is connected to the transmission, which powers the wheels of the vehicle. This type of transmission helps optimize the most efficient revolution per minute for the engine. This helps all-wheel-drive vehicles, like Subarus, gain back some fuel efficiency. This is the oldest type of transmission. It is where the driver selects all the gears manually using a movable gear selector and clutch. It is often called “stick shift,” or a “standard” transmission. While decreasing in popularity, this type of transmission can provide better fuel efficiency when operated correctly. Though even less common, there are also other types of transmissions, including automated-manual transmissions, dual-clutch transmissions, direct shift gearbox transmissions, and tiptronic transmissions. If you have a daily commute to work, you likely spend some time on both highways and city streets. For the sake of your wallet and the comfort of your drive, keep this in mind when picking out the perfect car for you. If this is how you primarily use your vehicle, that means you won’t need to tow or haul loads daily. So instead of opting for a vehicle with a large V8 engine that will give you way more horsepower than you need, you may want to choose a more economical vehicle with a smaller engine. Additionally, while a manual transmission will give you better fuel efficiency, it also requires a more active driving experience. Is this something you want on your commute? Do You Need To Tow? Do you tow regularly? Whether it’s a boat, trailer, or camper, you need a vehicle with proper towing capacity. Likely, you will need a car or truck with a V8 engine that has an automatic transmission. Typically, manual-shift vehicles tend to have lower tower ratings than their automatic counterparts. When thinking about what type of transmission and engine you need in your new vehicle, consider gas efficiency versus towing capacity and what is ultimately more important for your individual daily needs. Do You Carpool Or Have A Large Family? How many people you often have in your vehicle is another important consideration. Smaller cars and crossover vehicles can perform very differently when packed full of people. When test driving your prospective vehicle, try to include your family. Take the vehicle for a drive down the highway and consider how the car performs, the noise level at various speeds, and the overall comfort. Looking For A Houston Transmission Shop? Here at Tran Star Transmission, we are more than capable of handling all of your transmission replacements, repairs, and services. Whether you have an automatic, CVT, or manual transmission, we can provide the transmission service you need. Call us today at 713-574-1473 for more information. Ready for your free diagnostic check? Stop in our Houston shop today. We’re located at 6363 Long Drive, Houston, TX 77087.